October 15, 2013 (Jackson) - Dr. Howard Cleland, Belhavens former president, passed away Sunday, October 13 at the age of 95. Dr. Cleland faithfully served the students, faculty and staff at Belhaven University for 17 years, making him the third longest serving president. Dr. Roger Parrott, President of Belhaven University, commented, Howard leaves a great legacy behind. He was a wonderful Christian leader who cared deeply for students, and invested his life in thousands. Im glad that now, in heaven, he can fully see the fruits of his labor for the Lord." The legacy of his remarkable life and accomplishments are detailed in the obituary below written by his granddaughter Meredith Cleland Johnson. Howard was a wonderful Christian leader who cared deeply for students, and invested his life in thousands. Im glad that now, in heaven, he can see fully the fruits of his labor for the Lord. Howard Jonathan Cleland, beloved husband, father, grandfather and great-grandfather, went home to be with his Lord on October 13, 2013. He was 95 years old. Howard was born in Buffalo, Missouri, on July 5, 1918. He received a Bachelor of Science in English from Southwest Missouri State University in Springfield and a Master of Arts in school administration and psychology from Peabody College in Nashville. He was also awarded an Honorary Doctorate in law from Mississippi College and an Honorary Doctorate of Christian Ministries from Belhaven University. During World War II he served as lieutenant in the United States Navy in both the Atlantic and Pacific theaters of operation. In the Atlantic, his ship, the USS Humbolt, participated in the capture and return of the German U-boat, U-505. It was the only German U-boat seized intact during World War II. In the Pacific, he was involved in the invasions of Iwo Jima and Okinawa. At Iwo Jima, he witnessed and recorded in his ships log the raising of the United States flag on Mount Suribachi. After World War II his entire professional career was devoted to education administration. One of his greatest pleasures was his association with young people of all ages, and he took great pride in their achievements, both as students and later as graduates. He served as Bailey Junior High Schools third principal from 1947 to 1955. When Murrah High School opened in 1955, he was selected as the schools first principal and served until 1961. During this time, Murrah excelled in both academics and athletics and was named by Time and Newsweek magazines as one of the top high schools in the nation. Later, Murrahs athletic field house was named in his honor. 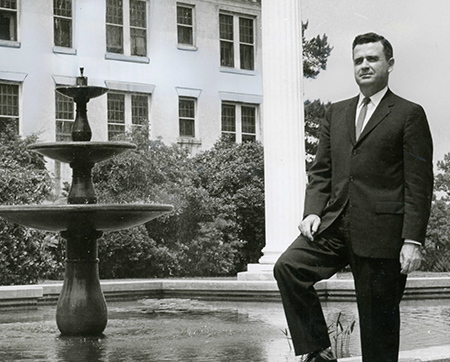 In 1961, he was named president of Belhaven University and served until 1978. Dr. Cleland strengthened Belhavens commitment to academic excellence based on strong Christian principles. He also expanded its facilities, increased enrollment and broadened its number of degrees. For many years he organized and directed the Mississippi Youth Tour, which later became Belhaven College Teen Tour. This tour provided hundreds of teenagers the opportunity to travel throughout the United States. He served as an elder at both First Presbyterian Church and Trinity Presbyterian Church in Jackson. He was past-president of the Mississippi Association of Colleges, the Mississippi Foundation of Independent Colleges and the Mississippi Association of Private Colleges. He served on the board of directors of the Jackson Chamber of Commerce and the Mississippi Economic Council and was a member of the Mississippi Congress of Parents and Teachers, Phi Delta Kappa, Delta Kappa Phi and the National Association of School Administrators. Dr. Cleland was also inducted into the Belhaven University Sports Hall of Fame. He had a love for art and gardening, painting countless landscapes and still life paintings in oil and growing beautiful roses and other colorful flowers for his family to enjoy. Dr. Cleland was preceded in death by his parents, Robert and Floral Cleland; two sisters, Inez Rhea and Marie Wattles; brother, William Cleland; and daughter, Jane OMara. He is survived by his loving wife of 69 years, Gustava Barksdale Cleland; three children, Beth Cleland Harper and her husband, Eddie, of DeBary, Florida, Dr. William Howard Cleland and his wife, Gyanne, of Brandon, and Charles David Cleland and his wife, Rebecca, of Madison. Howard was the proud grandfather of Charlie Harper and his wife, Charlotte; Stephen Harper and his wife, Kimberly; Cheryl Harper Poole and her husband, Cameron, Meredith Cleland Johnson and her husband, Chad; Drew Cleland and his wife, Kimberly; Kate OMara Chandler and her husband, Martin; Mandy Brownlee and her husband, Derrick; and Michelle Smith and her husband, Clayton. He was blessed with nine great-grandchildren.